PBS announced today its slate of Winter/Spring 2014 programs, including the long-awaited return of MASTERPIECE “Sherlock, Season 3” starring Benedict Cumberbatch as the legendary British sleuth, on Sunday, January 19 at 10 p.m. ET. The highly acclaimed “Sherlock” follows Season 4 of “Downton Abbey,” which debuts with eight new episodes January 5 on MASTERPIECE. The two shows bolster Sunday night as a hallmark of British drama on PBS, whose ratings that night have grown 26 percent (8-11 pm, 2011-12 season: 9/19/2011-9/23/2012 to 2012-13 season: 9/24/2012-9/22/2013) season over season. The schedule also reinforces PBS’ move into 10 p.m. programming on several key nights. PBS also announced a number of new programs, including the real-life adventure series CHASING SHACKLETON, the broadcast premieres of biopics “Salinger” on AMERICAN MASTERS (about the reclusive Catcher in the Rye author) and HAWKING, an intimate portrait of physicist Stephen Hawking’s extraordinary life and career, along with a roster of other new shows aimed to strengthen Wednesday night as a destination for TV’s best science and nature programs. According to Nielsen, PBS’ 2012-2013 primetime programming saw an overall average ratings increase of seven percent over season over season (8-11 pm, 2011-12 season: 9/19/2011-9/23/2012 to 2012-13 season: 9/24/2012-9/22/2013). PBS now ranks eighth among all broadcast and cable networks in overall general audience content, surpassed only by the four major broadcast networks as well as USA, Univision and Disney, and overtaking cable’s ESPN, History and TNT in the rankings. Previously, PBS ranked 11th. With British drama on Sundays, science and nature on Wednesdays, and arts and performance on Fridays, PBS is committing further to its proven formula of affinity night programming. The pairing of hits “Downton Abbey” and “Sherlock” on MASTERPIECE sets the stage for the March 30 return of acclaimed dramas CALL THE MIDWIFE and MASTERPIECE’s “Mr. 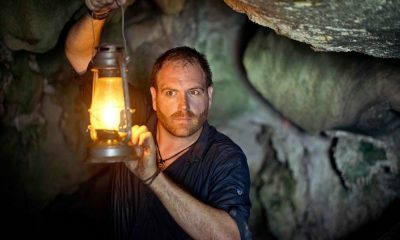 Selfridge.” Wednesday’s popular line-up offers the January 8 debut of the three-part CHASING SHACKLETON, in which five intrepid adventurers retrace the death-defying 1914 Antarctic sea-and-land journey by a shipwrecked crew led by Sir Ernest Shackleton. Soon after, is the four-part SUPER SKYSCRAPERS (February 5), which displays the dizzying heights of modern buildings, and the April 9th premieres of three-part miniseries NOVA “Inside Animal Minds” and YOUR INNER FISH, based on paleontologist Neil Shubin’s best-selling book that traces the human body’s development over millions of years. Mondays on PBS feature the broadcast premieres of 17 new and diverse films from INDEPENDENT LENS and POV, including legendary documentarian Frederick Weisman’s “At Berkeley,” which takes a deep look into the public higher education system (January 13), and the rollicking story of an off-beat American music mecca in the Alabama town of “Muscle Shoals” (April 21). Performing arts take the spotlight on Friday nights, with superstar Christopher Plummer onstage as the immortal John Barrymore in GREAT PERFORMANCES “Barrymore” (January 31), and music and dance programs scheduled throughout the season. News, history and public affairs remain a cornerstone for PBS with PBS NEWSHOUR, CHARLIE ROSE – THE WEEK and new thought-provoking programs such as AMERICAN EXPERIENCE “The Amish: Shunned” (February 4) and the five-part epic THE STORY OF THE JEWS (March 25-April 1). MASTERPIECE CLASSIC “Downton Abbey, Season 4” — Sundays, January 5-February 23, 2014, 9:00 p.m. ET — Season 4 of the international hit finds aristocrats coping with last season’s shocking finale. Change is in the air as three generations of the Crawley family have conflicting interests in the estate. Paul Giamatti appears alongside the beloved returning ensemble that includes Dame Maggie Smith, Elizabeth McGovern, Hugh Bonneville, Michelle Dockery, Jim Carter, Joanne Froggatt, guest star Shirley MacLaine and many others. A Carnival/MASTERPIECE co-production. MASTERPIECE “Sherlock, Season 3” — Sundays, January 19-February 2, 2014, 10:00 p.m. ET — Benedict Cumberbatch (The Fifth Estate, Star Trek Into Darkness) and Martin Freeman (The Hobbit, The Office UK) return as Sherlock Holmes and Doctor Watson in three new 90-minute episodes – “The Empty Hearse” (January 19), “The Sign of Three” (January 26) and “His Last Vow” (February 2) – of the contemporary reinvention of the Arthur Conan Doyle classic, written and created by Steven Moffat (Dr. Who) and Mark Gatiss (Game of Thrones). 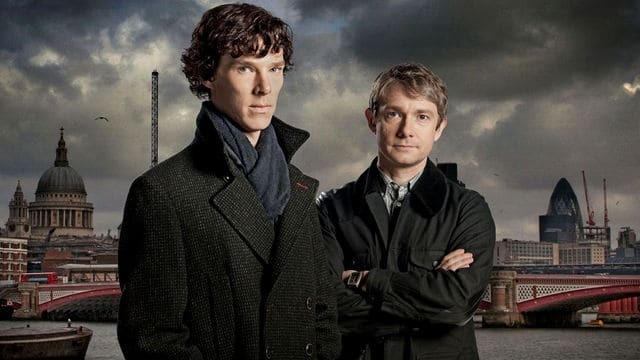 The Emmy and Golden Globe-nominated “Sherlock” has been a television sensation since the first season aired in 2010. CHASING SHACKLETON — Wednesdays, January 8-22, 2014, 10:00-11:00 p.m. ET — This new three-part series follows a modern expedition that re-creates Sir Ernest Shackleton’s Antarctic expedition. A crew of five intrepid explorers led by renowned adventurer, scientist and author Tim Jarvis in a replica of the original explorers’ lifeboat, uses only the tools and supplies Shackleton’s team used. When his ship The Endurance was crushed by ice and sank, Shackleton’s heroic leadership in the face of almost certain death saved the lives of 27 men stranded more than 500 days. HAWKING — Wednesday, January 29, 2014, 10:00-11:00 p.m. ET — Told for the first time in his own words, this is the intimate and revealing story of Stephen Hawking. Viewers join him at home with his nursing team; in San Jose as he wows a packed theatre; meeting a team of technicians who hope to speed up his communication system; and hosting a party for family and friends. HAWKING tells a life’s journey, from boyhood underachiever to PhD genius, from healthy Oxford rowing team member to a prognosis of just two years to live, and surviving several close brushes with death. AMERICAN MASTERS “Salinger” — Tuesday, January 21, 2014, 9:00 p.m. ET — The series’ 200th episode features interviews with 150 subjects, including J.D. Salinger’s friends, colleagues and members of his inner circle who have never before spoken on the record, as well as film footage, photographs and other material that has never been seen. Famous names of all stripes talk about Salinger’s influence on their lives, their work and the broader culture, including Philip Seymour Hoffman, Edward Norton, Martin Sheen, Tom Wolfe, E.L. Doctorow, Gore Vidal and many more. This film is the first work to go beyond the Catcher in the Rye author’s meticulously built-up wall to reveal his childhood, painstaking work methods, marriages and the secrets he left behind after his death in 2010. INDEPENDENT LENS “At Berkeley” – Monday, January 13, 2014, 10:00 p.m. ET — Legendary documentarian Frederick Wiseman goes back to school for this intimate and sprawling film. “At Berkeley” is a revealing documentary about the University of California at Berkeley, the oldest and most prestigious member of a ten-campus public education system and one of the finest research and teaching facilities in the world. GREAT PERFORMANCES “Barrymore” — Friday, January 31, 2014, 9:00-10:30 p.m. ET — In “Barrymore,” 83-year-old stage and screen legend Christopher Plummer portrays another titan of theater and film from an earlier age, the illustrious – and notorious – John Barrymore. This acclaimed film adaptation of William Luce’s 1997 play is set in 1942 during the final months of Barrymore’s life. On the stage of a Broadway theater, the famously combative star struggles to recreate his performance in Shakepeare’s Richard III, recalling the highs and lows of his remarkable life and career in the process. SUPER SKYSCRAPERS — Wednesdays, February 5-26, 2014, 10:00-11:00 p.m. ET — As urban space shrinks, we build higher and faster than ever before, creating a new generation of skyscrapers. Super skyscrapers are pushing the limits of engineering, technology and design to become greener, stronger, smarter and more luxurious than their predecessors. This four-part series follows the creation of four extraordinary buildings, showcasing how they will revolutionize the way we live, work and protect ourselves from potential threats. AMERICAN EXPERIENCE “The Amish: Shunned” — Tuesday, February 4, 2014, 8:00-10:00 p.m. ET — Filmed over one year, “The Amish: Shunned” follows seven former members of the Amish community as they reflect on decisions to leave one of the most tightly knit communities in the U.S. Estranged from family, ex-Amish find themselves struggling to make their way in modern America. Interwoven through the stories are voices of Amish men and women who remain staunchly loyal to their traditions and faith. They explain the importance of obedience, the strong ties that bind their communities together and the pain they endure when a loved one falls away. CALL THE MIDWIFE, Season 3 — Sundays, March 30-May 18, 2014, 8:00 p.m. 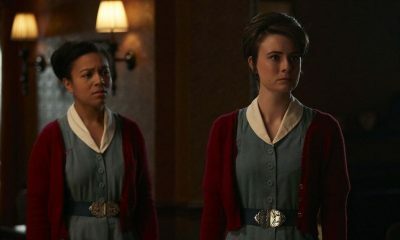 ET — The third season of CALL THE MIDWIFE takes viewers back to East London. It’s now 1959, the eve of the Swinging Sixties. The winds of change are sweeping through the country and the residents of Nonnatus House face some momentous changes of their own. MASTERPIECE CLASSIC “Mr. Selfridge, Season 2” — Sundays, March 30-May 18, 2014, 9:00 p.m. ET — Season two of the popular series starring Jeremy Piven as the flamboyant American entrepreneur who founded London’s famous Selfridge’s department store picks up in 1914, as the store celebrates its fifth anniversary. The acclaimed cast includes Frances O’Connor, Aisling Loftus, Katherine Kelly, Gregory Fitoussi, Amanda Abbington and Tom Goodman-Hill. The series is based on Shopping, Seduction & Mr. Selfridge by Lindy Woodhead. An ITV Studios and MASTERPIECE co-production. STORY OF THE JEWS — Tuesdays, March 25, 8:00-10:00 p.m. ET and April 1, 2014, 8:00-11:00 p.m. ET — This epic five-part series follows noted historian, author and critic Simon Schama as he explores the Jewish experience from ancient times to the present day in this new five-part series. Episodes focus on biblical times (“The Beginning”); medieval times (“Among Believers”); the enlightenment (“A Leap of Faith”); shtetl culture and its mark on the modern world (“Over the Rainbow”); and the post-holocaust era (“Return”). Co-produced by WNET/Thirteen and the BBC. In April, PBS lines up several new NATURE episodes, NOVA “Inside Animal Minds” and YOUR INNER FISH for three weeks of block-buster science and nature programming. NATURE — Wednesdays, April 9, 23, 30, 2014, 8:00-9:00 p.m. ET — NATURE this month covers animal prosthetics, Japanese macaque monkeys and wild mule deer. “Bionic Animals” (w.t.) (April 9) reveals that prosthetics made possible by the latest engineering and technology are enabling disabled animals to survive. “Snow Monkeys” (w.t.) (April 23) profiles the Japanese macaque, or snow monkey, an intelligent species known for unusual behaviors, including communal bathing in hot springs and rolling snowballs for fun. In “Touching the Wild” (w.t.) (April 30), Joe Hutto (“My Life as a Turkey”) literally enters deer society, crossing the species divide and tapping into a new understanding of these elusive animals. NOVA “Inside Animal Minds” (w.t.) – Wednesdays, April 9-23, 2014, 9:00-10:00 p.m. ET — We have all gazed into a creature’s eyes and wondered: What is it thinking about? What does it know? Now, the revolutionary science of animal cognition is revealing hard evidence about how animals understand the world around them, uncovering their remarkable problem-solving abilities and exploring the complexity of their powers of communication and even their emotions. In the three-hour “Inside Animal Minds,” NOVA explores these breakthroughs through the eyes of three iconic creatures: dogs, birds and dolphins. YOUR INNER FISH — Wednesdays, April 9-23, 10:00-11:00 p.m. ET — How did the human body become the complicated, quirky and amazing machine it is today? This cutting-edge scientific adventure reveals a startling truth: hidden within the human body is a story of life on Earth, and the legacy of animals that lived hundreds of millions of years ago. Based on the best-selling book by Neil Shubin, YOUR INNER FISH travels from Africa to the Arctic Circle to uncover the 3.5 billion year history of the human body – and how a colorful cast of ancient characters made us who we are today. THE BLETCHLEY CIRCLE, Season 2 — Sundays, April 13-May 4, 2014, 10:00-11:00 p.m. ET — THE BLETCHLEY CIRCLE returns for a second season, following four ordinary women with the extraordinary ability to break codes, a skill honed during World War II when they worked undercover at Bletchley Park, site of the United Kingdom’s main decryption establishment. The women use their code-breaking skills to solve crimes in post-war London. PIONEERS OF TELEVISION — Tuesdays, April 8-29, 2014, 8:00-9:00 p.m. ET — More than 200 breakthrough stars bring their stories to life in season four of this Emmy-nominated documentary series. Each episode melds compelling new interviews with irresistible clips to offer a fresh take on TV’s biggest celebrities. Featured stars in this season’s four new episodes (“Standup to Sitcom,” “Doctors and Nurses,” “Acting Funny” and “Breaking Barriers”) include Jerry Seinfeld, Robin Williams, Roseanne Barr, Bill Cosby, Tim Allen, Ray Romano, Noah Wyle, Anthony Edwards, Diahann Carroll, Howie Mandel, Bob Newhart and many more. INDEPENDENT LENS “Muscle Shoals” – Tuesday, April 21, 2014, 9:00-11:00 p.m. ET — Located alongside the Tennessee River, Muscle Shoals, Alabama is the unlikely breeding ground for some of America’s most creative and defiant music. The music of Muscle Shoals has helped create some of the most important and resonant songs of all time. At its heart is Rick Hall, who brought black and white together in Alabama’s cauldron of racial hostility to create music for the generations. In this joyful film, Greg Allman, Bono, Clarence Carter, Mick Jagger, Etta James, Alicia Keys, Keith Richards, Percy Sledge and others bear witness to Muscle Shoals’ magnetism and mystery, and why it remains influential today. COMING BACK WITH WES MOORE — Tuesdays, May 13-27, 2013, 8:00-9:00 p.m. 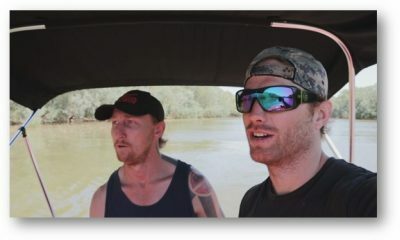 ET — Meet returning U.S. veterans as they welcome cameras into their homes and their lives in this three-part special programmed in time for Memorial Day. Hosted by combat veteran and The New York Times best-selling author Wes Moore, the series tells personal stories of an exceptional group of people, the challenges they face and their courageous efforts to overcome obstacles as they work to readjust to life back home. NATIONAL MEMORIAL DAY CONCERT (2014) — Sunday, May 25, 2014, 8:00-9:30 p.m. ET; rpt. 9:30-11:00 p.m. ET — Join co-hosts Joe Mantegna and Gary Sinise for the 25th anniversary broadcast of this iconic event that offers a tribute to our men and women in uniform, their families at home and all those who have given their lives for our country. Broadcast live from the West Lawn of the U.S. Capitol, the night of remembrance features an all-star line-up with the National Symphony Orchestra before an audience of hundreds of thousands, millions at home and beamed to troops around the world on the American Forces Network.